We first met twin sisters, Jack and Jill, in Every Heart a Doorway. They were seventeen when they found their way back to their parents’ house and thus were shipped off to Eleanor West’s Home for Wayward Children. This is the story of what happened first. In Down Among the Sticks and Bones we see how Jacqueline, before she became Jack, was the perfect princess daughter and how Jillian, before she became Jill, was the perfect tomboy. We understand how the twins learn at five that grown-ups can’t be trusted. We see them discover the impossible staircase that leads them to a land filled with mad scientists and death but most importantly choices. However beautifully magically Every Heart a Doorway was, this is even more spectacular. In the hands of a inferior writer, this book could easily be 300 pages. Okay, I wanted it to be 300 pages because I did not want it to end. But this does not negate the fact, that every sentence is magnificently written. Each sentence is meticulously craft that so much is said in these 176 pages. I loved every second of it. I loved it so much that I re-read both books a few times over the course of a week. 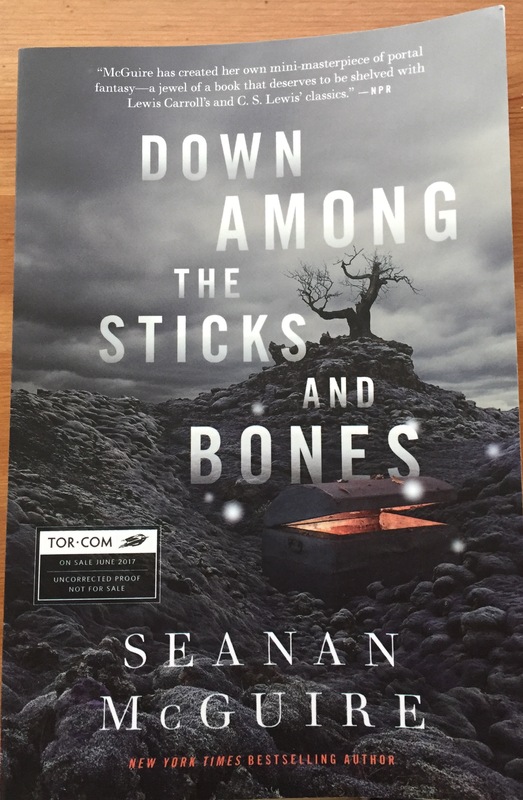 Down Among the Sticks and Bones comes out June 13th. If you haven’t already read Every Heart a Doorway, a) what’s wrong with you? and b) go forth and read one of the best books of 2016 so that you can be prepared for one of the best books of 2017. This entry was posted in Young Adult and tagged Down Among the Sticks and Bones, Seanan McGuire, Wayward Children, Young Adult. Bookmark the permalink.